Understanding how to properly clean your own chimney will not only save you money, it will create a safer burning environment, reducing the chances of a dangerous chimney fire. Creosote buildup and chimney fires are a common concern for anyone who heats their home with firewood. Although precautions such as seasoned firewood, proper fire temperature and draft can all help reduce excessive creosote buildup, you should thoroughly clean your chimney at least once a year. Typically, a chimney should be cleaned in the fall before the burning season begins. This will remove prior creosote deposits, plus it also removes any debris from the chimney flue such as dead animals, bird nests or leaves that could decrease draft. Occasionally, if you burn a lot of wet firewood or if your wood stove is not burning efficiently, you may need an additional cleaning in the middle of the winter to insure a safe fire. Important - You should never attempt to clean your own chimney with an active fire. The chimney should be cool and no fire should be present. Also, wear protective equipment such as a dust mask and eye protection while cleaning a chimney. Why Clean Your Own Chimney? When you clean your own chimney you accomplish three things. First, you remove the creosote that has built up on the inside of the chimney walls. Creosote is usually classified into three different stages. The first stage of creosote is a fine dust or flake like substance that falls off easily. Second stage creosote looks like a black brittle sponge, however, it still flakes off pretty easily when using a brush to clean your chimney. You will typically have a larger buildup of first and second stage creosote near the top of your chimney where the gasses have cooled down and they come into contact with the cool exterior chimney walls. Third stage creosote looks like like a shinny black glaze or tar that's extremely difficult to remove. 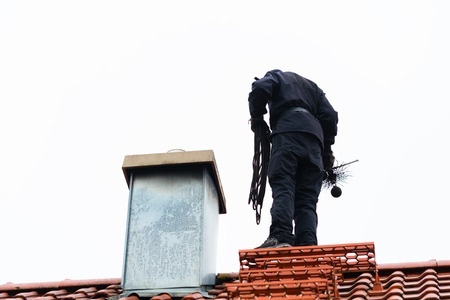 If you locate third stage creosote, it's best to contact a professional chimney sweep to remove it since it will take more than just a common brush. Finally, while sweeping your chimney take the time to shine a flashlight inside the chimney to inspect all the chimney components for damage. Look for cracks in the chimney liner, damage to the chimney crown, or damage to the chimney damper or flue. Since every chimney and setup is different, you may have to modify these steps to meet your specific chimney design, however, the process should be very similar. 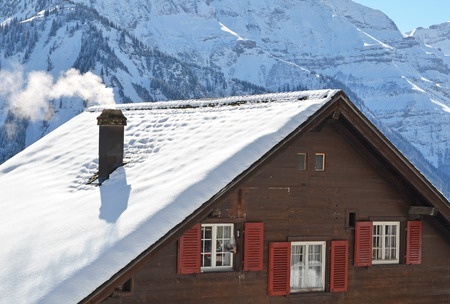 There are 4 different ways to effectively clean your own chimney. Each has positive and negative factors so choose a method that works best for you. No matter which option you choose, make sure to purchase a brush that properly fits your chimney. Typically, your flue will either be round or square. Measure the size and shape of your chimney flue and purchase a brush to meet those dimensions. Also, if you have a metal chimney liner such as stainless steel or aluminum, use a poly chimney brush that won't scratch the flue. If you have a clay tile or cast in place flue, a metal or poly brush will work. This is usually the most popular way to clean your own chimney. It's quick and easy but it involves climbing up on your roof which may not be ideal for everyone depending on the time of year, pitch of your roof and whether or not you're afraid of heights. However, this method allows you to completely seal off the interior of your fireplace making it the cleanest way to sweep your chimney without having ashes and soot cover the interior of your home. 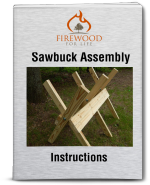 To begin, use a sheet, tarp or other device to seal off the opening of your fireplace. This will prevent soot and ash from covering items inside your home. If you have a wood stove, remove the pipe from the device and tape a garbage bag around the open end. Next, take your brush and cleaning rods and climb onto the roof. Your chimney could have a chimney cap that will need to be removed before any cleaning takes place. The cap is usually attached by a few screws. Remove the screws and the cap should easily pull off. Attach one section of rod to the brush. Now, using an up and down motion, begin sweeping the inside of the chimney. While sweeping the chimney, make sure you don't twist the rod in a counterclockwise direction or you could accidentally unscrew the rod from the brush. Attach additional rods as you scrub down the entire chimney. Once you thoroughly scrub the entire chimney, use a flash light to inspect the inside of the flue looking for any creosote buildup. If it looks clean, reinstall the chimney cap. Finally, go back inside and remove the sheet you placed over the fireplace entrance. Take a small brush and clean around the damper. Use a vacuum to clean up any soot or creosote that fell off during the cleaning. If you have a wood stove, clean out the top of the wood stove and reattach the pipe. Seal off the fireplace or wood stove as previously described. Take your brush, weight and rope and climb onto the roof. This method uses a weight that's attached to the bottom of the chimney brush. To clean the chimney lower the weighted brush down the flue. Pull the brush up and down to scrub the inside of the flue. Once the flue is cleaned, reinstall the chimney cap (if you had to remove one) and clean out the fireplace or wood stove as previously described. Although I prefer the rod and brush method, this method allows you to seal off the inside of the chimney which prevents the dust from covering the inside of your home. However, it requires standing on your roof which could be dangerous. Take your brush with ropes attached to each end and climb onto the roof. 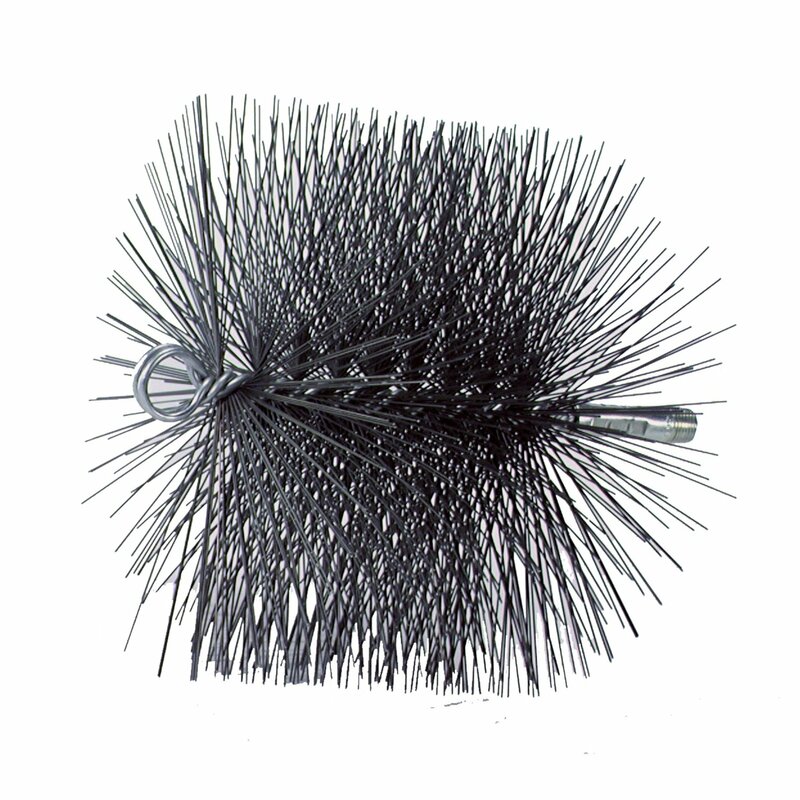 This method uses a chimney sweep brush with a rope tied to each end. First, remove the chimney cap. Next, place one person inside the house and drop one end of the rope down the chimney. Using the ropes, pull the brush back and forth throughout the chimney scrubbing away any creosote. This option is somewhat of a hassle because it requires two people and you can't seal off the interior of your home. Plus, you're still required to climb on top of your roof. When you're done, reinstall the chimney cap and clean up the interior of the fireplace or wood stove as previously described. This method is similar to method #1 however you don't have to climb on top of your roof. You won't be able to seal off the inside of your home, so it could spread soot or ashes. To decrease the chances of ruining your furniture, cover nearby items with tarps or sheets. If you're cleaning a wood stove, remove the pipe from the unit. Attach the brush to the rod and push it up into the flue from the base of your fireplace or wood stove. Scrub the brush back and forth as you clean up the flue. Attach additional rods as you move up the chimney. 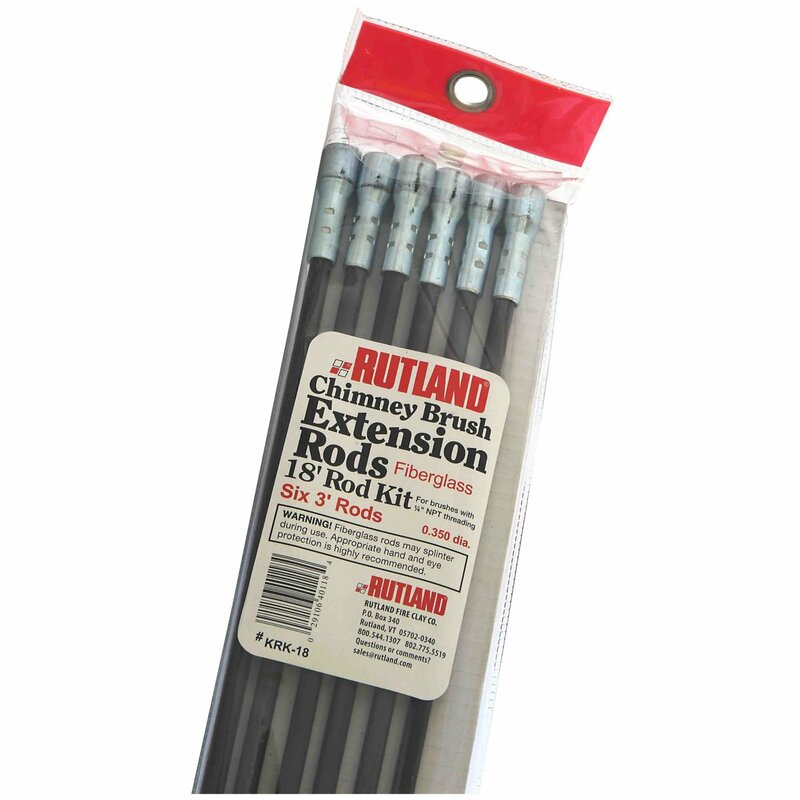 As previously described, don't twist the brush in a counterclockwise direction or the brush will fall off the rod. After you clean the entire flue, remove the brush and use a mirror and flashlight to inspect the chimney. If it's clean, sweep up any debris that fell during off the cleaning process and you're done. Although this method allows you to stay off the roof, it's dirtier and it's somewhat cumbersome to clean the flue from the bottom up. 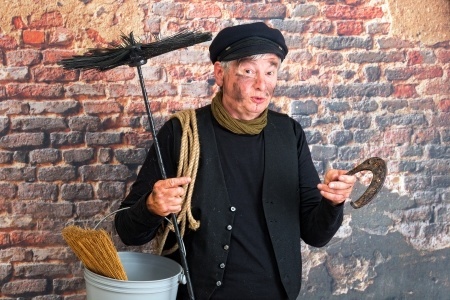 Learning how to clean your own chimney is not a difficult task. With a few simple supplies and about an hour of your time, you can efficiently remove creosote from your chimney and help reduce the chances of a chimney fire.